History of Olympia Waldorf School Inspired by an introductory lecture given by Elana Freeland in 1983, a handful of parents set to work to establish a Waldorf school in Olympia. In March 1985, the Olympia Waldorf Education Association was formed and was recognized by the Association of Waldorf Schools of North America (AWSNA). After gaining legal nonprofit status and adopting bylaws, Olympia Waldorf School opened its doors to 17 young children that fall. The school added grades one by one until we graduated our first Grade 8 class in June 2000. Now, each spring we send out into the world a group of amazing young people. Our program has expanded to include a preschool, two kindergartens and eight grades. Olympia Waldorf School’s Prairie Hall was formerly the home of the East Olympia School and was originally called the Chambers Prairie School. 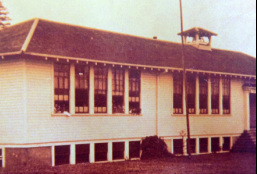 It was built in 1914, and opened its doors in 1916 to 38 students and two teachers in Grades 1 through 8. This homey, wooden building has been in continuous use as a school ever since. After five years of renting space, Olympia Waldorf School took a great step forward in 1990 and moved into this beloved historical site. In 1999, our community built a new Middle School building, and in 2007, we renovated and opened the Kinderhaus on adjacent property. History of Waldorf Education The first Waldorf School opened its doors in September 1919 in Stuttgart, Germany as a way of providing a new kind of education for the children of factory workers. The school was housed in the Waldorf Astoria Cigarette Company, and classes were taught during working hours. The founder of Waldorf education is Rudolf Steiner, an Austrian philosopher and scientist who was dedicated to educating free and independent humans for the renewal of our society. The school he founded in 1919 was revolutionary for its time, open to children from all social, religious, racial, and economic backgrounds. The curriculum was equally radical, as it was driven by a comprehensive cultural orientation in which the arts played a central role, and in which the three-part human being – spirit, soul and body – was acknowledged and nurtured. After World War II, the Waldorf schools were the first private schools to be re-opened by the American occupational government for the very reason that they had previously been closed: they were committed to teaching independent thinking. Waldorf schools have continued to thrive throughout Europe, and have spread to Africa, North, Central and South America, Australia, New Zealand, Japan and China. In North America, nearly 200 schools are currently in operation. Here in the United States, the demand for an improved educational system has helped Waldorf Schools flourish in the last few years.